From Southern California, a model of success for water’s future. 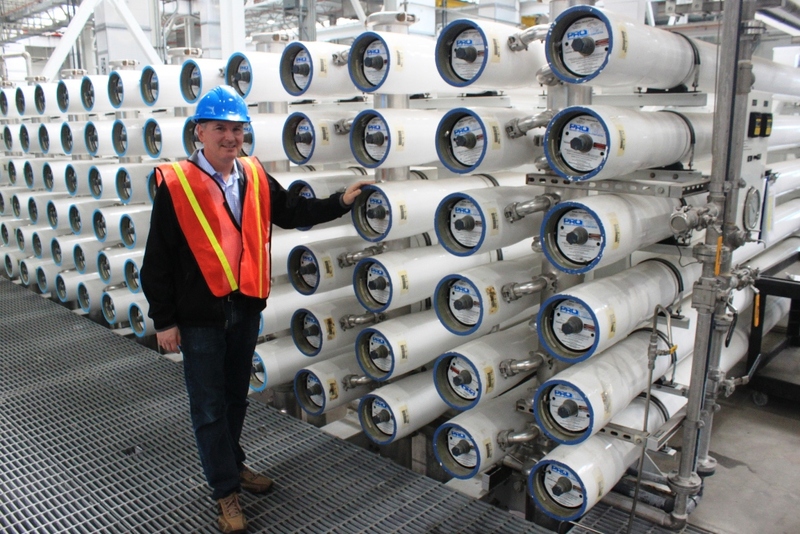 Denis Bilodeau, a director of the Orange County Water District, points to the reverse osmosis system in the district’s $US 481 million wastewater recycling plant. The facility purifies sewer water and injects it into its drinking water aquifer. California officials say projects like this are necessary for increasing the state’s water supply. Click image to enlarge. FOUNTAIN VALLEY, California – For those who believe technological leaps will rescue society from a collapsing ecological house, the cluster of monochrome industrial buildings next to the Orange County Water District headquarters holds wonders. Inside is the holy trio of modern water-treatment technologies, the three purification processes that strip water to its elemental hydrogen and oxygen core: microfiltration, reverse osmosis, and ultraviolet radiation. These are the discoveries, used in sequence, that close the urban hydrologic cycle, that transform the dirty liquid that goes down the household drain into clean water that can flow again from the faucet. Water recycling is heralded as the Next Big Thing for municipal water supplies – a drought-proof source of new water. But it is a mistake to think that the availability of technology alone will create water’s future. Orange County’s $US 481 million recycled water system – in operation since 2008, but with a history that stretches back to the 1960s – is evidence that other forces are required. Strong relationships between local, state, and federal agencies are equally important building blocks, as is collaborating with the public. As California prepares for a fourth dry winter during its dreadful drought, there is wide agreement among water professionals and government officials that reusing wastewater, a relatively abundant source already coursing beneath city streets, will be essential to meeting 21st-century needs. Water agencies send 3 billion gallons of wastewater into the Pacific Ocean each year, according to the California WateReuse Association, an industry group. Much of that could be put to use, with significant benefits. Recycled water does less damage to the environment than building new reservoirs or pipelines that tap distant rivers or groundwater basins. It also uses less energy, and thus is less costly, than facilities that remove the salt from sea water. Though the advantages of recycled water are clearly recognized by cities at home and abroad, from California to Australia to Singapore, the promising technology will remain in the box unless local water agencies develop the social, technical, and financial relationships that push an idea from concept to completion, according to a number of water officials in California. The need for working relationships among the jumble of water agencies, government entities, and civic groups is especially true for systems that reuse the water for drinking, as Orange County does. “We learned that you have to have a lot of partners,” said Denis Bilodeau, an Orange County Water District director. In an interview with Circle of Blue, Bilodeau was reflecting on the years before the recycled water facility even broke ground. The water district worked with scientists, the county sanitation district, and state and federal agencies. Winner of nearly every major water industry award, the district’s Groundwater Replenishment System, as it is formally called, has become an international model for collaborative water solutions and an instructive case study for how to successfully reuse wastewater for drinking. The Orange County Water District (OCWD) is better positioned than most water agencies. Formed in 1933 in response to declining groundwater tables, the district has been for generations a pioneer in water-treatment research and aquifer management. The district today manages a groundwater basin that provides 2.4 million people in coastal Southern California with 60 percent of their water. OCWD’s history with advanced wastewater treatment began in the 1960s when it needed to hold back the sea. The county was withdrawing too much groundwater, leading to a decrease in the aquifer’s hydraulic pressure, which allowed the Pacific Ocean to creep inland through the sandy soil. After a successful trial project to test the technology, OCWD built Water Factory 21, a defense system to protect its fresh groundwater. Completed in 1976, the project planted the seeds of the modern recycled water facility. Water Factory 21 took wastewater from the Orange County Sanitation District, pushed the water through tiny membrane pores in a process called reverse osmosis, and used the purified supplies to form a freshwater barrier against the Pacific. The water was then injected into a curtain of 23 wells near the coast that repelled the salt. Recycled water accounts for 30 percent of the water supply in Singapore, which is investing heavily in advanced water treatment capacity. The small island nation that is home to 5.4 million is cutting its reliance on water imported from neighboring Malaysia. 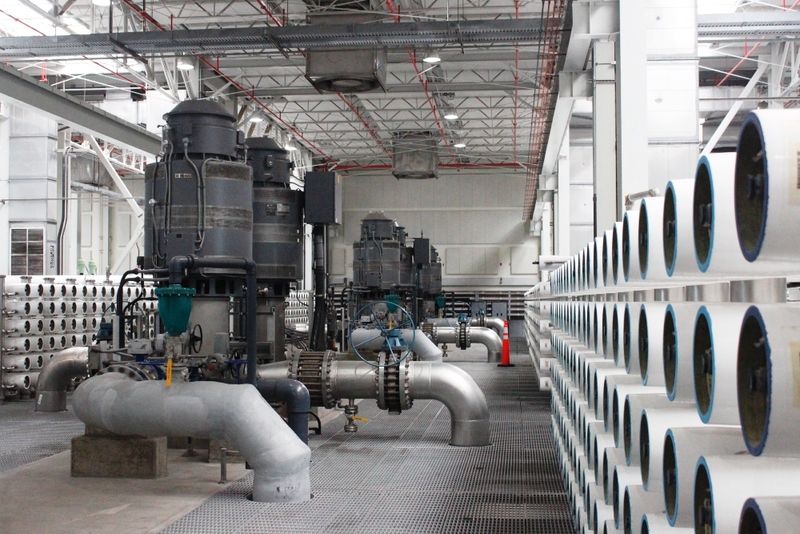 It is building new desalination plants in addition to recycled water facilities. Orange County’s blueprint is spreading. Officials in Perth, Australia broke ground last month on a similar recycled water system that will be used to boost supplies in aquifers used for drinking water. The sanitation district provided the water free of charge. Since then, the two agencies – which are neighbors in Fountain Valley – have worked together to transform urban water management in the county. By the 1990s, the opportunity for a deeper collaboration presented itself. The OCWD needed additional water supplies, and the sanitation district needed a way to dispose of the increased use. Because of changing conditions, it was apparent that the old sources were not going to be enough to meet Orange County’s demand. Inflows to the aquifer from the Santa Ana River were declining due to dry weather and more upstream water consumption. Additionally, state agencies were starting to restrict the amount of water that was being pumped through canals from reservoirs in the north to cities in the south. The district had traditionally used this imported water, along with Santa Ana River flows, to refill its aquifer. The sanitation district, for its part, needed to build a second pipe into the ocean to dump its growing volumes of wastewater, a project with a $US 200 million price tag. Instead of moving in two directions, the agencies moved as one, building a single facility that met both their needs, breaking ground on the Groundwater Replenishment System in 2003. The project would treat wastewater to drinking water standards, injecting half the output into the saltwater barrier and piping half to inland basins where it would filter into the aquifer and eventually be pumped out by water users. The sanitation district contributed as much wastewater as needed, still free of charge, while OCWD agreed to build enough treatment capacity so that the facility could handle the peaks in sewer flows after a heavy rain. The cost of construction was split evenly. “We took the partnership to the next level,” said Jim Herberg, general manager of the Orange County Sanitation District, in an interview with Circle of Blue. Both agencies came out ahead – the often discussed, but rarely observed “win-win.” The sanitation district did not have to build a new ocean outfall and it saved on operating costs – less use of energy and chemicals – because it was pumping less water out to sea. OCWD received a local, reliable water source to buttress its aquifer. Getting water required one relationship; getting money required others. State and federal dollars helped build the Groundwater Replenishment System. Construction costs were supported by $US 72 million in state grants, a $US 20 million grant from the U.S. government, and a $US 180 million low-interest loan from the state. OCWD also gets an operating subsidy of $US 7.5 million per year from the Metropolitan Water District of Southern California, the regional wholesaler, for reducing the need for water that would otherwise be imported from Northern California. The Orange County Water District’s award-winning wastewater recycling plant opened in 2008. Producing 70 million gallons of water per day from the neighboring sewage plant, the $US 481 million facility is an important asset in the district’s water supply plan. Click image to enlarge. Because of the drought, Governor Jerry Brown (D) has freed up more state money for water recycling projects: $US 800 million in low-interest loans approved by the State Water Resources Control Board in March and $US 725 million in a water bond approved by the state’s voters earlier this month. These funds – though alone they are insufficient to achieve the state’s water recycling goals, which will require $US 13 billion to $US 81 billion – are an important boost for local districts. The regulatory agencies play an important role in attending to unintended consequences. If a water district wants to recycle more water, it will discharge less wastewater. This is not a problem for coastal cities, which send their waste to the ocean. But for inland cities, an increase in water recycling means less water returned to rivers. In California, all the river water is already spoken for. A change in water discharge must be approved by the State Water Resources Control Board. This is an area where collaboration could be improved. Bilodeau said that Orange County is beginning to see less water flowing in the Santa Ana River as upstream water agencies reuse more water. Those concerns are supposed to be addressed in the permitting phase, but the state’s nine regional divisions, which handle the permits, sometimes fail to look across jurisdictions, according to Victoria Whitney, deputy director for water quality at the State Water Resources Control Board. “The regional boards are doing the permitting, but they are siloed and may not be aware of the water rights issues,” Whitney told Circle of Blue. Developing agreements between water districts before an increase in recycling takes place can avoid the negative consequences. That is the case in Texas, where the city of Houston has a handshake agreement with five upstream water providers in metropolitan Dallas to maintain minimum flows of wastewater into the Trinity River, which provides 71 percent of Houston’s drinking water, according to Alvin Wright, spokesman for the public works department. “Everybody’s happy right now,” Wright told Circle of Blue. Public support for recycled water projects is essential to their success. Orange County laid the groundwork early, beginning its community outreach programs at least six years before beginning construction, said Herberg, the sanitation district general manager. The two districts held public forums starting in 1997 and met individually with any group that had concerns about the project. An independent expert panel – comprised of engineers, scientists, and environmental groups – was formed to provide criticism and feedback. “We brought the community with us instead of informing them afterwards,” said Jennifer Cabral, spokeswoman for the sanitation district. Other agencies in California recognize the pioneering work that OCWD has done on water recycling. Santa Clara Valley opened its own advanced recycled water project in March, a $US 72 million project that, in its technology and partnerships, looks remarkably similar to Orange County’s system. OCWD, for its part, continues to push boundaries. The district will open a $US 142 million expansion of the Groundwater Replenishment System next year, allowing it to recycle half the sanitation district’s wastewater, up from 35 percent today. A bold investment nearly a decade ago is continuing to pay dividends. “What was a good idea before is looking even better now because of the drought,” Herberg said.